One is the Loneliest Number: Managing the "One Product / One Team Scenario"
In the last blog post, we talked about how different product managers find themselves in different situations. Every product is different; most companies organize their teams differently, and individual product managers bring different skills and experience to the table. One thing they all have in common is the need to influence, decide, and advocate in order to help their products advance in the market. 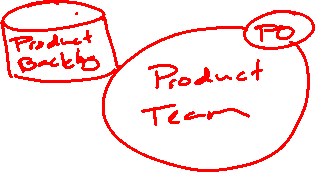 In this post, we’ll dig into the simplest case and talk about how product managers function in a world where a single PM manages one product being worked on by one team. Although this isn’t the most common case in the industry, it is foundational for understanding the role of the product manager and the responsibilities as well as the levers he has to pull. In our following blog posts, we’ll jump into more complex cases of product management leadership. In this first scenario we describe, we truly have a superhero product manager who is working as part of a single product team that design, builds, and brings to market a single product. Sometimes we find this scenario in fledgling startups where people are working with all their will to make it. Sometimes we find this scenario in larger corporations where a small group of folks get to focus on an isolated offering. I had this opportunity only once and it was one of the scariest, yet most thrilling experiences in product management. You truly get to do it all (sales support, strategy, customer support, and the techy stuff), but there’s a catch. You are responsible for it all too. A team of people and potentially the entire company is counting on you to chart a course forward, to make the right decisions, and to balance the future with the right now. Let’s look at the product manager’s life in this role, starting with what she influences, decides on, and advocates for within this product model. The product story – this is the explanation of what we are building, why we are building it, and who we are building it for. The above is a general framework. Your mileage may vary somewhat, and there may be a fair bit of overlap between these categories. There might be some other items that are missing as well. The main takeaway is that this is an awful lot for one person to balance and to look after. When it comes to influencing in this model, you’ll be spending a lot of time seeking alignment. You need alignment from the company’s senior executives. Getting that can be hard enough, but keeping it is the real challenge. You also need alignment from the product team and other players in the product ecosystem. They need to understand and believe in the path you all are on together. The deciding piece truly comes down to what you will build. There is so much prioritization and elements to balance here and you will never have enough people and money to do all you want to do. Get used to making tough choices. Your ability to make those choices and to allow your team to focus will determine your product’s success in the market (and how fun it is to work on this product, too). In the advocating piece, you need to take care of your most precious assets – people, funding, and potential revenue. This gets quite challenging because often taking care of the bottom line and driving growth are in direct contradiction to taking care of people. The successful product manager finds the right balance of both. Shoot, it’s now clear that this product manager has an awful lot to do. How does he/she manage it all? Let’s take a look at some of the struggles PM’s face in this structure and some traps to avoid. This PM is faced with an insane amount of skills to master. There are very few people that have them all. The rest of us need to mitigate our weaknesses and leverage our strengths. Everyone around you will have opinions about what you should be doing. Few of them will agree with you. As the product manager, it is your job to drive the bus. You don’t do that without listening, but you must accept that you will never please everyone. Winning for this product manager is all about balance. He needs to be equally thoughtful how he invests in his product and how he invests his own time. He’ll never be everything to everyone, and if he tries, he’ll likely burn out in no time flat. When in doubt, focus on relationships and communication because you need a tight group of trusted people around you that are all rowing in the same direction. This gig is hard, but you’ll have a higher degree of control and influence than you’ll likely ever have. Enjoy it, fearless product manager; you don’t get too many of these opportunities in your career. Watch the product management webinar series to learn how to optimize your product backlog!